Being promoted into a position of leadership is an exciting time! For some, it is a recognition of your experience and achievements, for others, a vote of confidence in your potential. Understanding, and then accepting what it takes to be an excellent leader of others – can be challenging for many. The things that made you who you are, that form a key part of your identity, may not be what is critical to success in your new leadership role. As we wrote about in a blog entitled ‘Leading people when they know more than you’, the things that made you successful before, might be the things you need to ‘let go of’ to be successful in the next passage of leadership. New skills need to be developed and some of the old ones need to be left behind. that people leadership is not about YOU! What will it take for this employee to be successful? What does this organisation need to provide in order to hold up to its end of the bargain? How would you answer these questions? What can you do to help facilitate each team member’s success in your organisation? 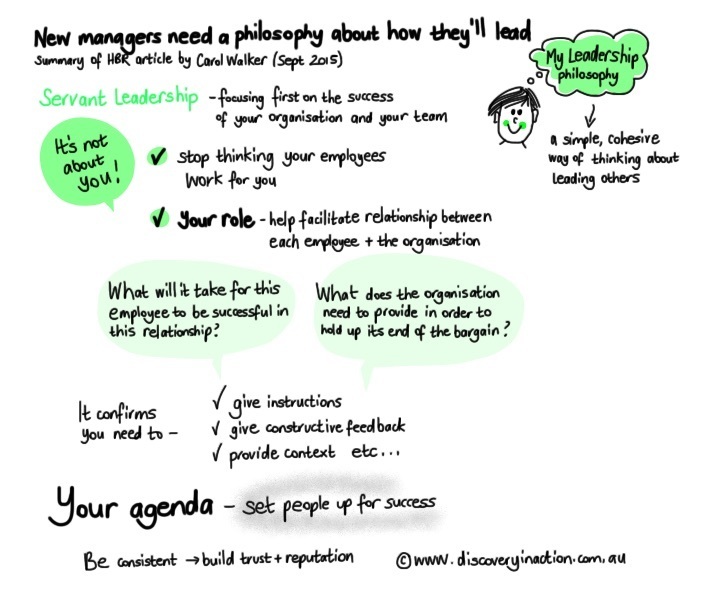 Click here to see full article called ‘New Managers need a philosophy about how they’ll lead’. This concept of having a leadership philosophy is consistent with our Discovery in Action program. With DIA, we go one step further : participants develop their own unique people leadership model – consisting of beliefs about when people perform at their best, as well as the detailed actions and behaviours that support those beliefs. This is tested with those they lead, and each leader identifies an action plan to help leverage their strengths, and tackle any gaps. If you want to know more about our Discovery in Action leadership program, please contact us. If you are an alumni of the DiA program, get out your model, and start the year with a fresh reminder about what people need to be their best, and how you can help make that happen!